Community Corner - Happy Birthday to Hairco! 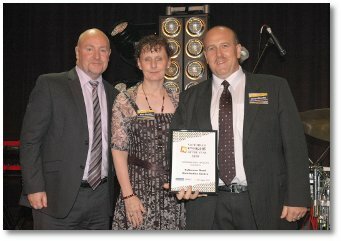 On Saturday 19th February 2011, the Victorian Newsagency Industry (VANA) held its industry awards night to celebrate excellence in the Newsagency channel for 2010. 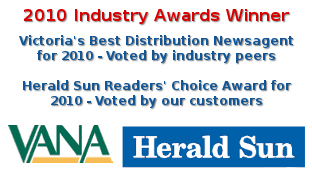 The awards where presented by VANA, the Victorian Newsagency Industry Association at the Newsagency Industry Gala Dinner, held at the Sofitel Melbourne On Collins. The Patterson Road Tatts, News & Post team attended the awards dinner in full force. Click here to view some of the great photos from the night. Free to join and offering over $450 in prizes, don't miss the opening round of our AFL 2011 Footy Tipping Competition. Are you a footy tipping expert? Join our Footy Tipping competition to find out how you rate amongst other local tippers. The competition is open for all to join now, with tips for the 1st round closing at 5-30pm on Thursday 24th March. To participate in the Footy Tipping Competition simply join online at www.pattersonrroad.com.au and enter your weekly tips by 5-30pm on the day before each round starts. If you miss a week you will be awarded points for the away game results. You’ll also find loads of team and game history to help with your tipping as well as the weekly league ladder once the season is underway. There are prizes awarded each week as well as end of season prizes. In total there is over $450 in prizes to be won throughout the competition, so join up now! It’s free to join and to enter your weekly tips for all of the 2011 AFL season. If your team tops the overall ladder after 24 weeks, you'll win $50,000 cash and $5000 for a local footy club of your choice. Like a real coach, you'll select, trade & bench your players in pursuit of the ultimate prize. The game is difficult to master, but easy and absolutely free to play. Advance entries and Superdraw syndicates are now available for the $20 Million TattsLotto Superdraw on Saturday 26th March. Community Corner - Happy 19th Birthday to Hairco! Having relocated to 74 Patterson Road sixteen months ago Rachel, Louise & Vicky are now celebrating Hairco’s 19th Birthday. Having received a fantastic welcome from the local community they have enjoyed every minute of their time in Patterson Road.